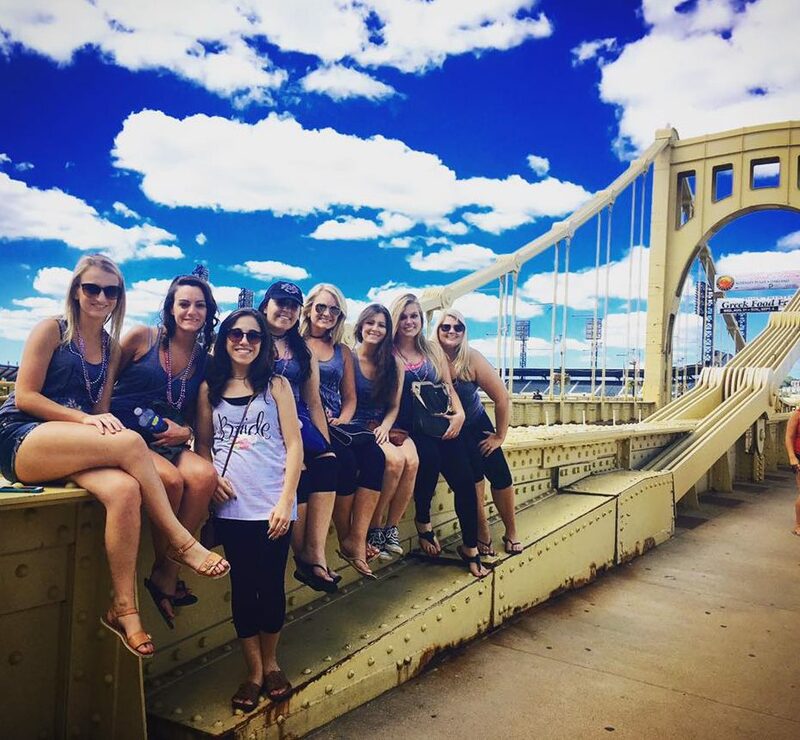 Savannah, her bridesmaids and close friends spent a memorable bachelorette weekend in Pittsburgh, saying goodbye to her single days. Friday night Savannah wore a “Sweating for the Wedding” t-shirt while the group participated in a Fitness with a Twist event. Fitness with a Twist is the latest fitness fad where participants learn how to, you heard it right – pole dance! Pole dancing uses all the core muscles giving enthusiasts a well-toned body. The Pittsburgh based company also hosts fun events for amateurs and ladies interested in a lively group bonding activity. Priceless! 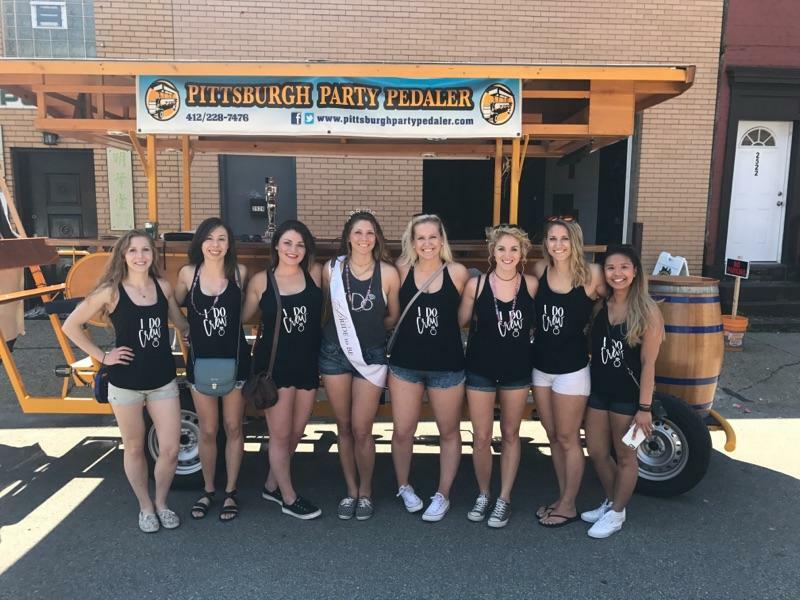 The next day the ladies started off with the Pittsburgh Party Pedaler. Savannah’s friends and family did it again, and planned an entertaining activity for the bachelorette party. The Pedaler drove the group around the Strip stopping along the way at various points of interest, namely bars and pubs. The ladies did grab lots of attention. Their beauty alone would have done it but the friends also planned matching outfits. The ladies wore black tanks that said, “The I Do Crew” in fancy white script. Savannah’s tank said, “I do” in a more bold white script. Savannah also wore a “Bachelorette” sash and a tiara that glimmered, “Bride”. Many onlookers cheered and took photos as the glam gang toured the city. 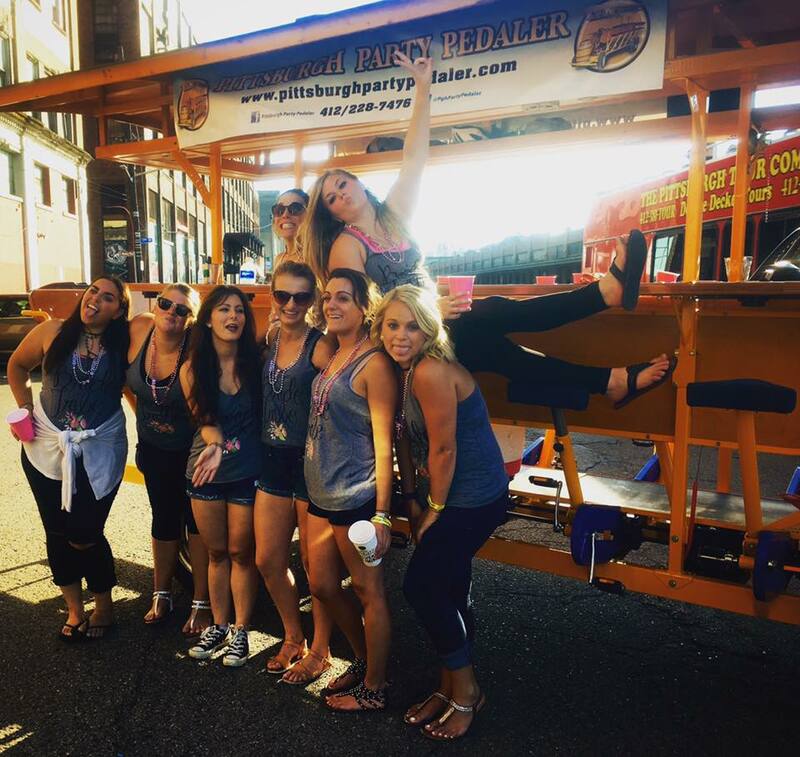 The bachelorette party posed in front of the Pittsburgh Party Pedaler. Savannah shows off her “Bride” tiara, along with three of her mates. Next the ladies got dolled up for an amazing evening ahead. The agenda included dinner and dancing! The supporting ladies wore their favorite little black dress and Savannah wore her fav, in white. She also modeled her brilliant sash and tiara. Savannah and her crew thoroughly enjoyed their dinner at the Melting Pot. Such a novel interactive idea that has withstood time, dipping foods into gooey yet gourmet and full-flavored cheese and chocolate – absolutely deliciousI! After dinner the bachelorette party went dancing and closed out the fun. Savannah had a great time and now truly ready for the next step in her life – her wedding day! 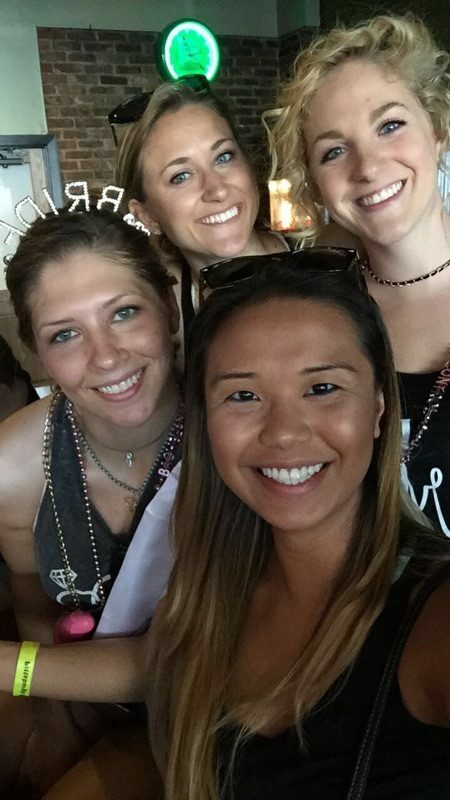 Katie’s friends gave Katie a singularly fun-filled bachelorette weekend that would make Cyndi Lauper proud. Katie’s Bachelorette party in Pittsburgh Labor Day weekend. 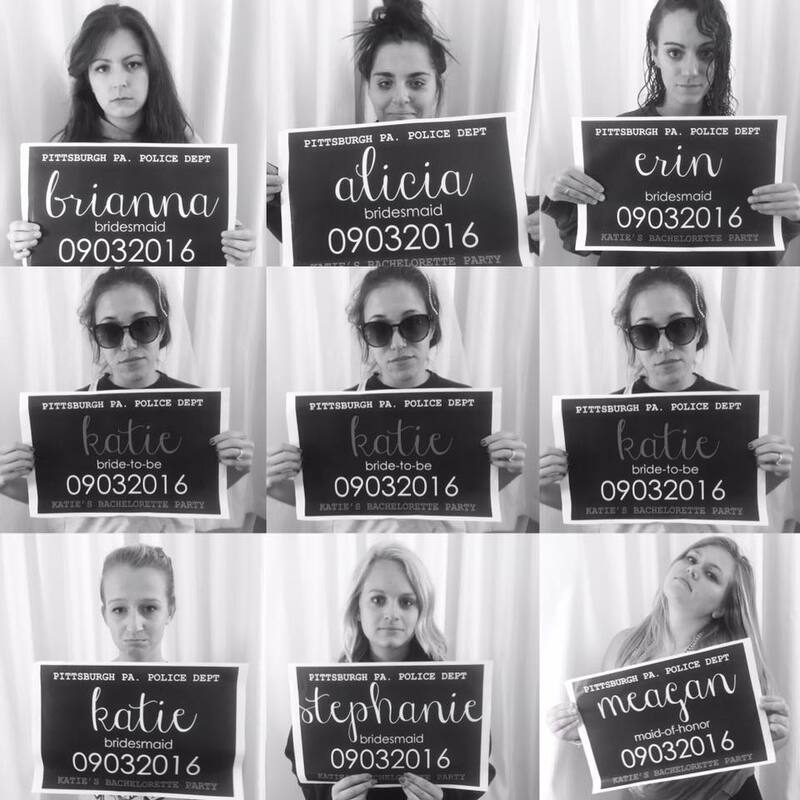 Katie’s bachelorette party weekend mug shots. The group stayed at the Hilton in the hip newly revitalized Market Square. It is a traditional public square with food, shops, entertainment, events and not to mention, great people watching. Market Square proved to be the perfect location because it allowed for a convenient walkable and bike-able weekend. The ladies met up Friday at the Hilton to primp and then started the night out right by drinking Hurricanes at NOLA on the square (yes, as in N’awlins, Louisiana). Next, they had dinner at Bakersfield, an upscale simple Mexican restaurant known for tacos, tequila and whiskey. The group ended the evening with cocktails at Sienna Mercato’s Iltetto rooftop beer garden, with a spectacular view of the Three Rivers City. For breakfast, the girls found Katie’s favorite breakfast – donuts! After tasting the delightful pastries they kayaked downtown on the rivers. However, the highlight of the weekend was the Pittsburgh Party Pedaler. The Party Pedaler came with a bicyclist, stocked bar and music! The ladies just had to rotate serving each other and selecting the right tunes. They rode throughout the city and sang and drank! Everyone on the street was taking pictures and videos of the party wagon – Katie relates, I felt famous! 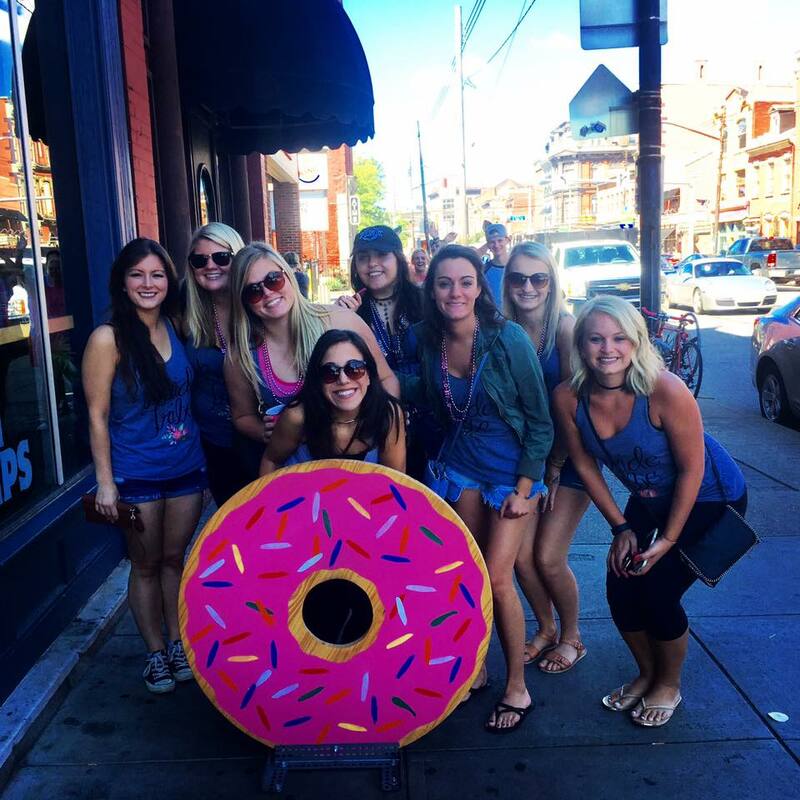 Katie’s bachelorette party is outside the donut shop getting ready for Day 2! 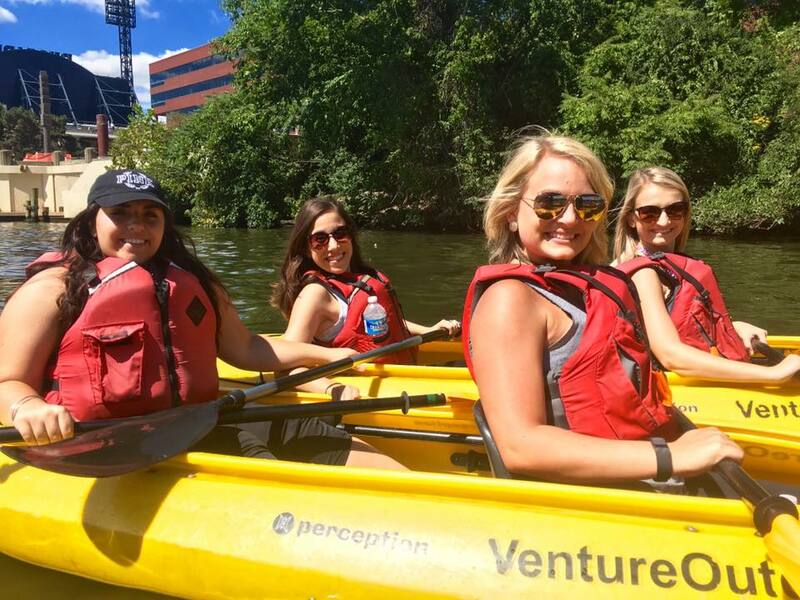 Katie and her bridesmaids kayaking in Pittsburgh for her Bachelorette party weekend. Katie’s bachelorette party posing next to the Pittsburgh Pedaler. After the Pittsburgh Pedaler the party nibbled more at different restaurants throughout the Square. They ended up at Howl at the Moon – once known as a dueling piano bar and now more of a full concert show and bar. The gang hit the dance floor grooving to pop hits and party anthems to close out the night. It is fun to see brides-to-be whoop it up for their final days as a bachelorette. And with our digital age we can experience it via video. Using a GoPro. Posted on YouTube. See Katie’s video record. The fun is quite contagious. I have a strong feeling her wedding day at Quincy Cellars will be too!